Born in Queens, New York City, L.A. CLINE earned a B.A. at Montclair State College and supported herself by drawing portraits and creating medical illustrations for doctors. Now over 40 years the passion of Pastel Painting goes on. In addition to the many custom commissioned portraits L.A. CLINE has painted for clients’ homes and offices, the artist also has created works that are on permanent display, which include portraits within the Lawson E. Thomas Courthouse Center in Miami, Florida; Florida International University in North Miami, Florida; Florida’s Third District Court of Appeal in Miami, Florida and the Sidney M. Aronovitz United States Courthouse in Key West, Florida. Two Fine Art Giclee Reproductions of L.A. CLINE’s Original Memorial Portrait Paintings, The Honorable Judge Sidney M. Aronovitz and The Honorable Judge Lawson E. Thomas are in the Smithsonian Institute in Washington DC’s American Art and Portrait Gallery Library, in their “Living Artists File”. This file can be viewed by the public to learn about American Heroes and the artists that created their images. The “Living Artists File” also serves as a recommendation for future art commissions. Over the years, L.A. CLINE has been featured in numerous art showings, magazines and galleries. The Artist is a long time member of the Pastel Society of America in New York City. On April 10, 2013 William G. Allman, Curator of the White House accepted the portraiture portfolio of L.A. CLINE for their files as an Artist in consideration for the Presidential Portrait. In January 2014 L.A. CLINE was awarded the People’s Choice Award for the Art displayed at the 7th Annual Fine Art Show at the Lauderdale Yacht Club. From August to October 2014, L.A. CLINE had the privilege of a solo Artist showing featuring a Collection of Original Giclee Embellished Floral Giclee’s at Neiman Marcus, Fort Lauderdale. Each Giclee is personally enhanced by hand and becomes a one-of-a-kind work of Art. L.A. CLINE exhibited embellished unique Fine Art Gilcee’s at the Agora Gallery in New York City from December 1-20, 2015. 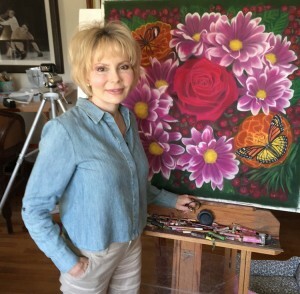 The Artist is featured in the ArtisSpectrum Magazine, presenting the new painting, “Romancing the Rose”, http://www.artisspectrum.com/magazine/34/#56. (PAGE 56) L.A. CLINE featured the Floral Art in VENU Magazine in the Art and Objects section with a mention of the exhibit in the Gallery Section. 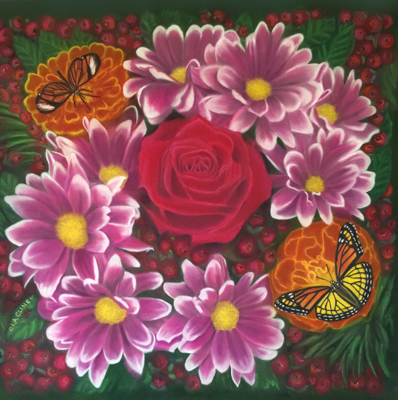 In addition to the other collections, the Artist has devoted the last fifteen years to creating a Nature Collection of Florals, Wildlife and Landscape Pastel Paintings that bring the beauty of lives and our world close up and personal. L.A. CLINE’s Pastel Paintings are the result of a multi-layered process. The artist starts with a pencil sketch to scale that is the blue print for the painting. Then carefully and meticulously over many weeks the Artist starts building the many layers of colors and tone while ensuring the clarity of each line and shape. The finished Pastel Painting is then the source of Gilcee prints which are then embellished with layers of medium that gives each embellished Gilcee it’s own unique personality and appearance. The Art L.A. Cline creates reflects the legacy of the world we live in. Each painting that you adore brings out the timeless beauty that is within each of us. These are the objects of our desire with special meaning that we place in our personal environment to enjoy and tell the stories of our time on this earth to future generations. From the image of the Original Pastel Painting “Romancing the Rose”, I created a 28″ x 30″ Fine Art Giclee replica that I heavily hand embellished with Pastel that gives the canvas image the Artist’s touch and a more 3D look. 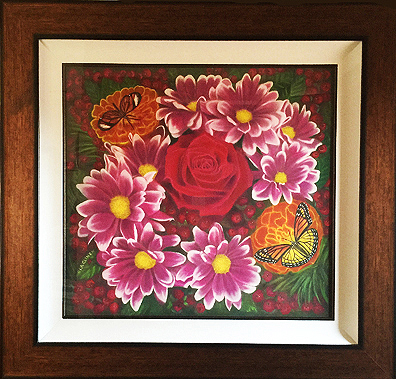 This floral art is a celebration piece with all the excitement of the flowers placement and colors. The frame includes a Linen Liner and a beautiful solid wooden frame with rubbed golden color in the center with a filet around the inside of the canvas. The unique piece is sealed with a un-breakable UV Plexi-Glass. With the frame the Giclee Painting measures 42″X 44″ and is sprayed with an Archival matt spray to protect the pastel and for UV protection. This is an Original Pastel Portrait Painting of the legendary singer Tony Bennett that I created with different shades of grays, crème’s. 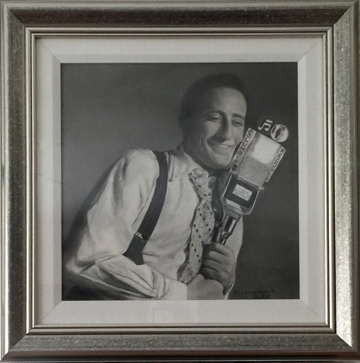 Even though the overall color scheme is monotone, great care was taken to include many shades of gray including purple-gray, red-gray, blue-gray and more to portray this beloved entertainer. 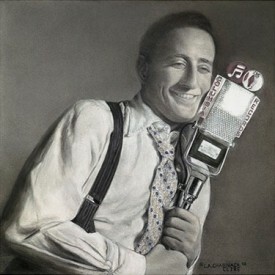 This depiction of a young and dapper Tony Bennett shows him at the beginning of his career at Columbia Records. Now in his ’80’s, he is still going strong! Great gift for any music lover whose idol is the legendary Tony Bennett. It is framed beautifully in a solid wooden silver tone frame with a linen liner. The framed original one of a kind pastel painting measures 29 1/2″ X 29 1/2″. 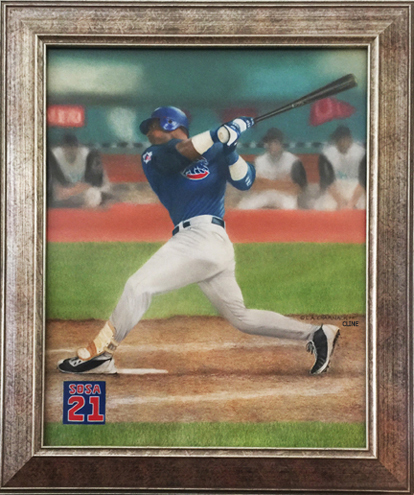 This sports Original Pastel Portrait Painting captures the power action of Sammy Sosa “Up At Bat”, measures framed 22 1/2″ X 27 1/2″. You can see from his stance, his intense concentration and athleticism within the batter’s box. The sunlight bounces off his form and displays his celestial presence to onlookers within the stadium. Accurately capturing this light, was challenging in this portrait of Sammy Sosa. This game was played at Pro Player Stadium now Sun Life Stadium in Miami Florida. I was at this game when he hit this his 49th home run of this season and the Cubs won the game 7-3. You can see the blurred images of the Florida Marlins players on the bench. I was important for me for you as the view to fell that Sosa is standing solid in the dirt. What I did was to use layers of pastel and sharpened the image of Sammy Sosa putting him in the foreground. You can almost feel his elbow piercing through the painting. 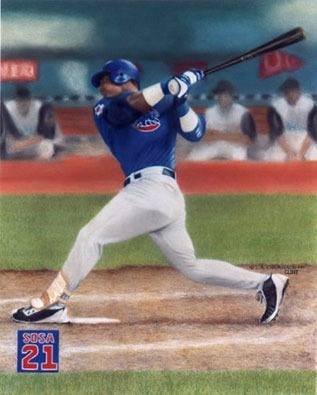 On September 29, 2002 Sammy Sosa belted a two run homer at Wrigley Field off of Pittsburgh Pirates pitcher Josh Fogg in the first inning to end his 2002 season with 499 career home runs. 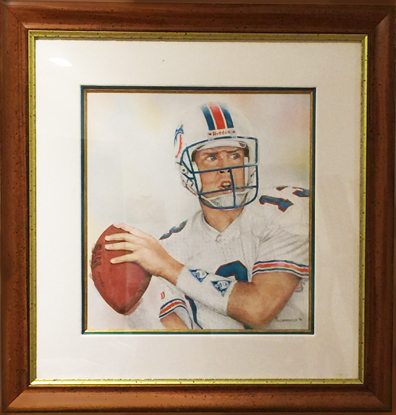 This 36 1/2″ X 37 1/2 Framed Original Pastel Portrait Painting of Dan Marino is framed with the Dolphin Colors on the inside wooden filets along with the distressed heavy wooden frame enhances this painting to the max! View the Video. I created this painting while Jimmy Johnson started to coach for the Dolphins. Painted in 1996 this piece was a show stopper at all my art shows. The intense stare of Marino’s blue eyes setting up for that long pass. The Dolphin even lent me his uniform so I could capture every detail. 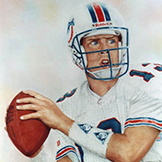 If you are a Dan Marino fan this painting is an extraordinary piece for your collection.